Variables are used in QField and QGIS to dynamically set values based on the current project file, the layer or the system. They can be used for styling, setting default values for fields and much more. To configure a device-specific variable, open the settings and click the “Global Variables” tab. Configuration of two new global variables in addition to the pre-defined system variables. On the variable page, you can see predefined variables. To add new variables, click on the empty cell at the bottom and write the content. 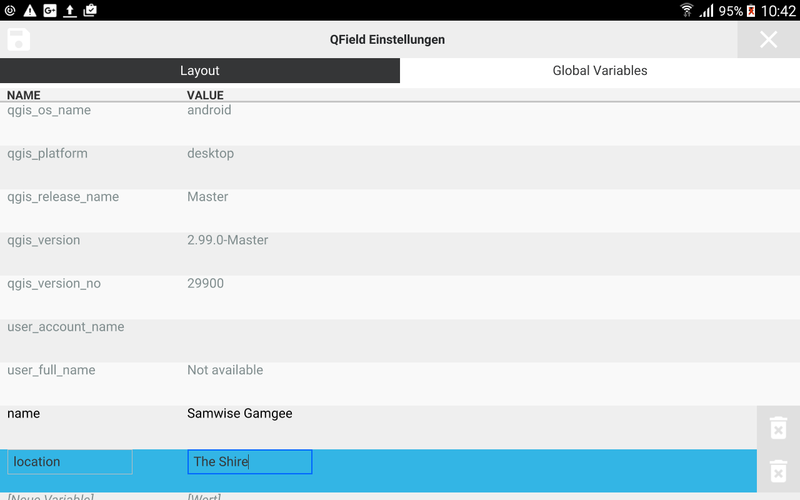 © Copyright 2019, The QField Project/OPENGIS.ch.